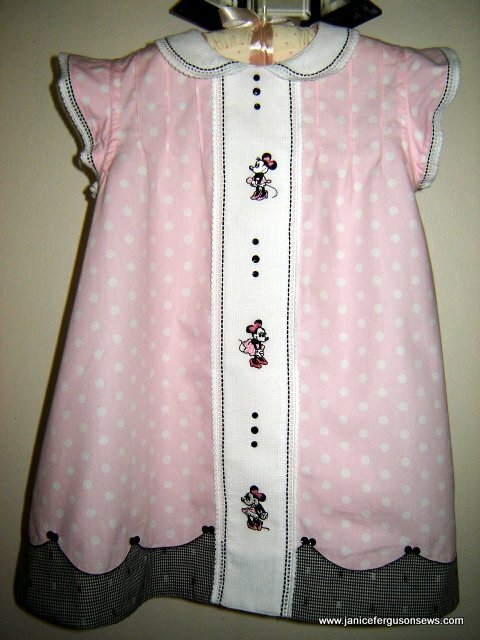 Penny by Petite Poche (Wendy Schoen), size 3, is ready to be shipped to granddaughter Vivian. 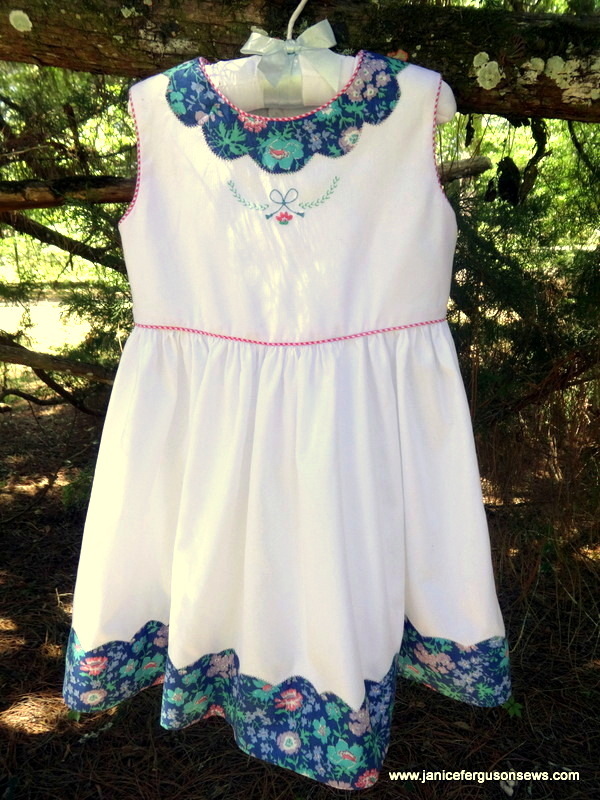 This little summer dress is finally finished. It’s progress was interrupted by a variety of issues, all outside the sewing room, but now Penny has been removed from my UFO list. I have always loved this pattern and finally got around to making it. 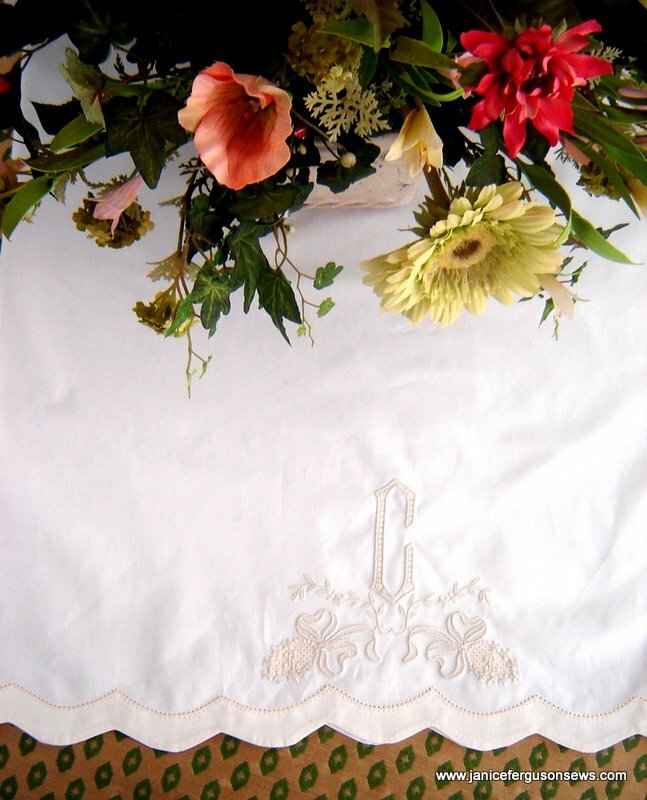 Making these table linens was a nice break from sewing for my granddaughters. 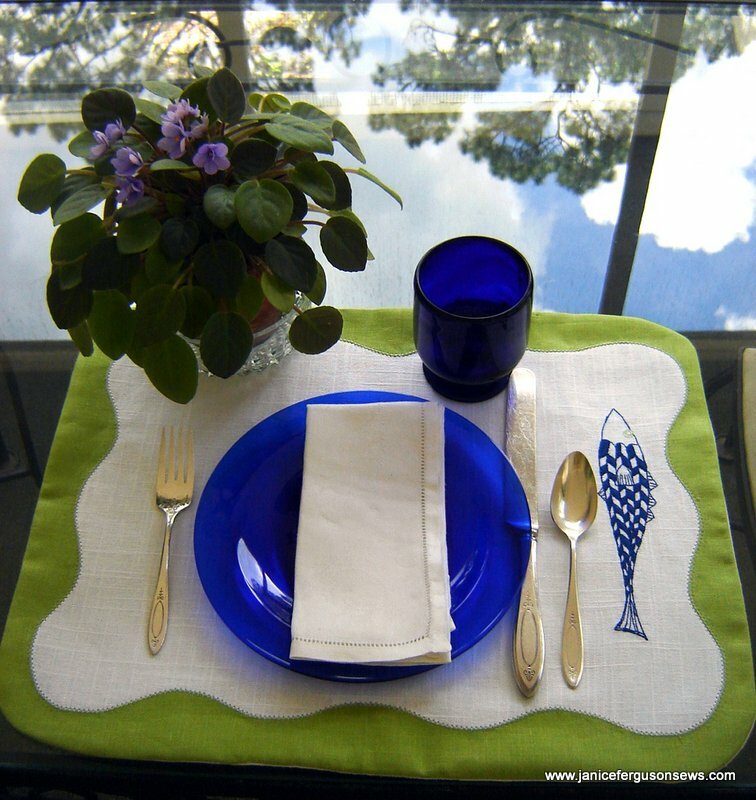 Fine white linen is paired with lime green and embroidered with a fun blue fish. This color combination reminds me of the beach, just 30 miles away. Sitting on the screened breakfast porch, looking out over our front yard with this table setting made me just as happy that I was not roasting on Daytona Beach and scanning the waterfront for sharks. It’s very peaceful on my porch. I enjoy pulling out dishes and napkins that coordinate with the setting. UPDATE: And look at it now. 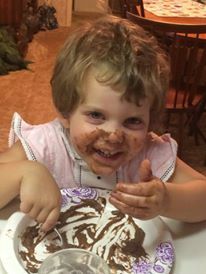 Viv “eating”Aunt Peggy’s chocolate pudding. Surely some got in her mouth. Our precious granddaughter Vivian Rose recently celebrated her first birthday with family and friends at a party in her own back yard. 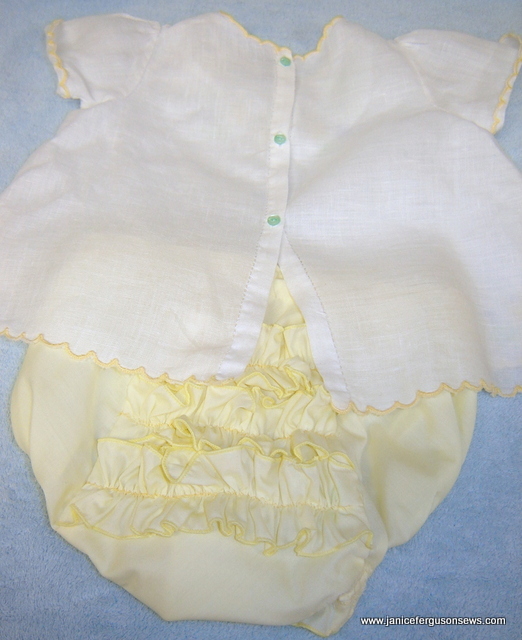 The scallops and embroidery are a very soft pastel yellow, not nearly like the bright color that shows up on my monitor. 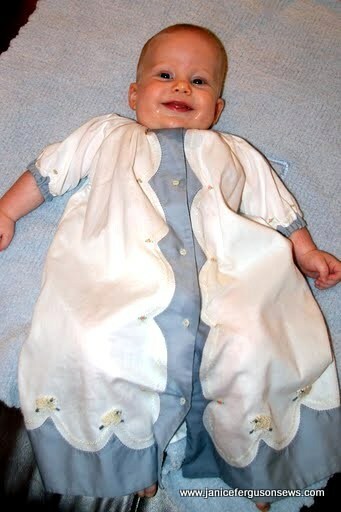 ‘m approaching the panic mode as my new granddaughter concludes her cozy stay in utero. So few items have been sewn for her! 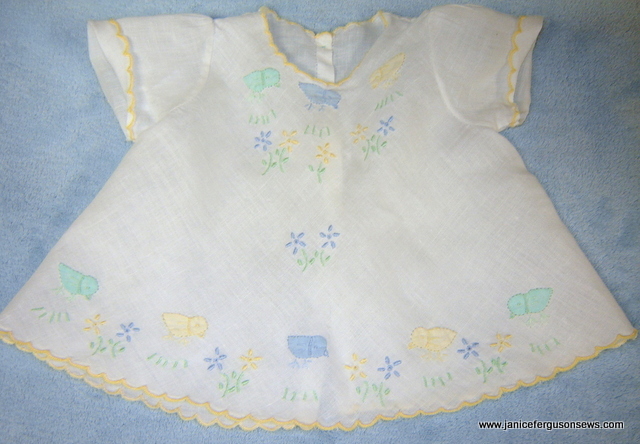 A few smocked daygowns (Liberty of London, striped Swiss dot), a smocked white pique diaper shirt, a Swiss flannel slip, the ho-hum bassinette sheets, and the bassinette skirt. 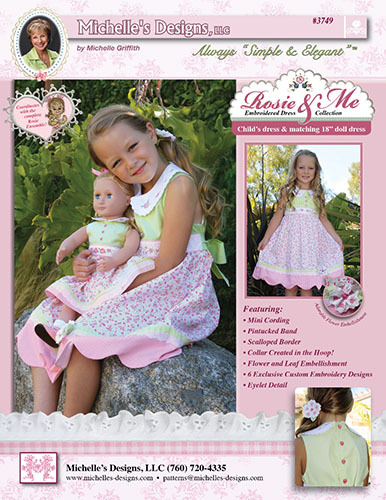 On my cutting table sits a tall, tottering stack of fabric and patterns which I expected by now would have been stitched into an even taller stack of sweet baby garments. 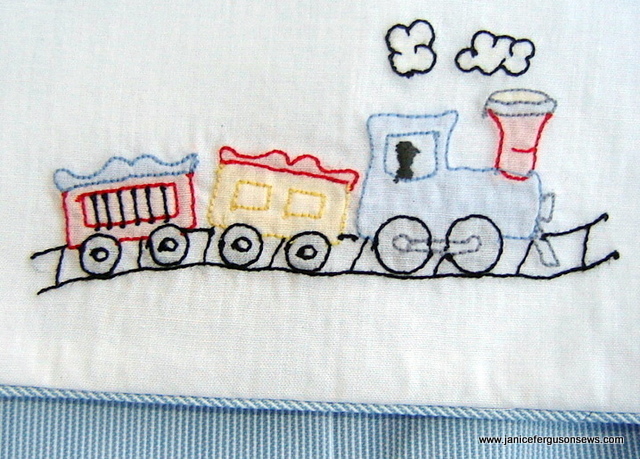 A pair of these pillowcases were stitched for my daughter’s birthday, which is this week. 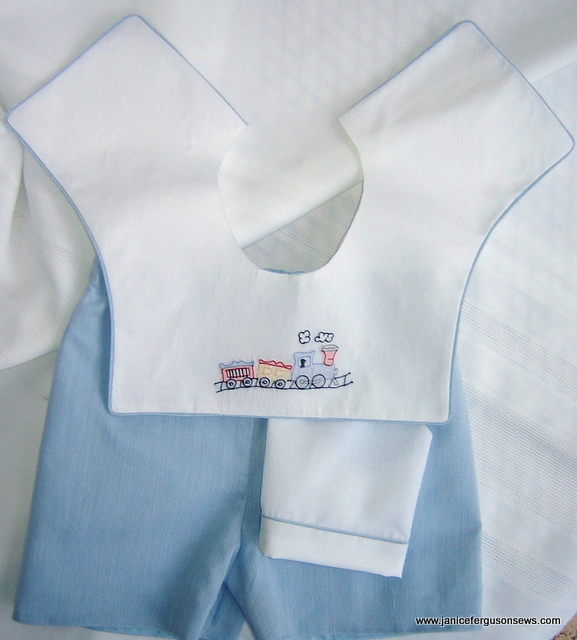 She loves pretty linens and monograms, just like her mother, so this pair of pillow slips should please her. Things have been incredibly hectic around here for these past few days. 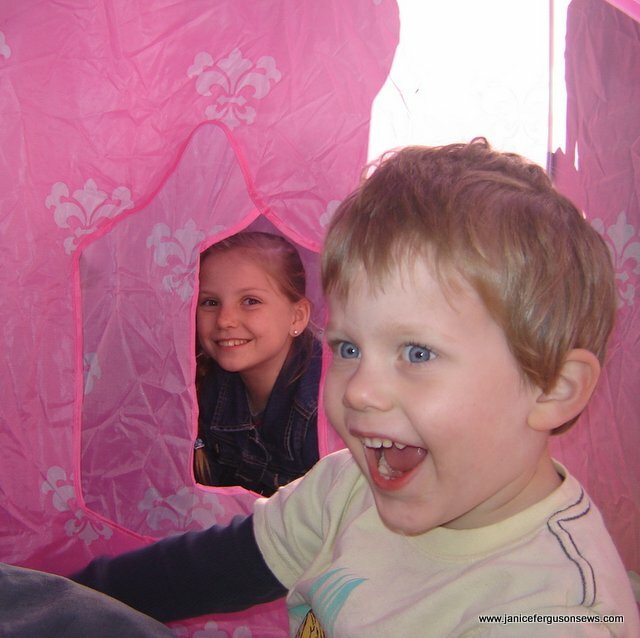 My few free hours have been spent working on this blog, enlarging the pictures and trying to insert a custom photo at the top of each page. Apparently, WordPress gremlins are foiling my efforts because sometimes it works and sometimes it doesn’t. I have a pit bull personality. Long after determination and perseverance becomes nothing more than beating my head against the wall, I bang on. But after many of my own wasted hours trying to insert the custom header, then fruitless consultation with my computer scientist daughter (#1 Tech Support), I’ve stepped away from the issue. #2 Tech Support, my computer genius son-in-law, was not even approached as he is up to his USB port designing complicated stuff beyond my ken. So now that I’ve put it aside, I’ve moved on to getting a “store” up. I’m doing this on my own, without above mentioned tech support, so it will be fairly primitive. But it should work. 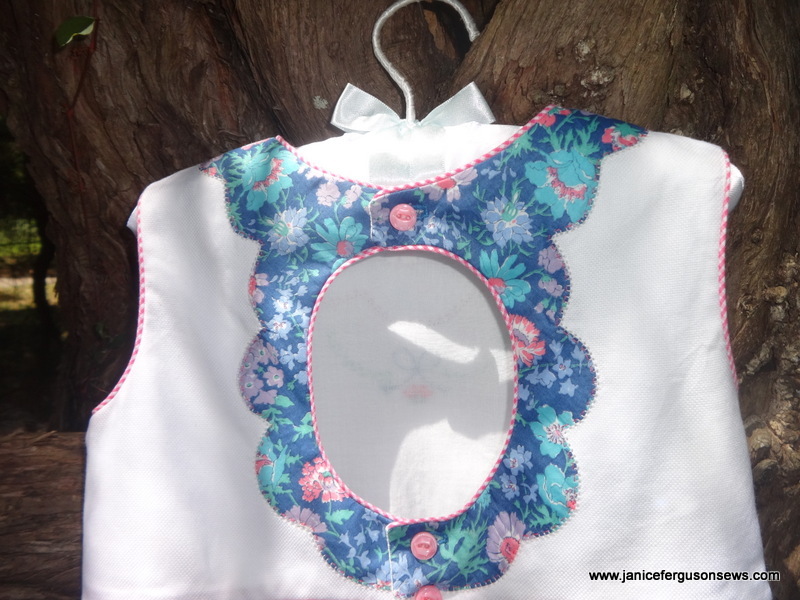 My original purpose for this blog was to have an outlet for my excessive sewing chit chat and to sell some of my excessive sewing supplies. As of today, I have written 414 posts. See what I mean about excessive chit chat?!? Surely NO ONE has read all or even most of these. So while I continue to scan, photograph, describe and price store inventory, some of the earliest posts will be re-run. This is a stroll down memory lane for me. It’s probably a walk down a new path for you. 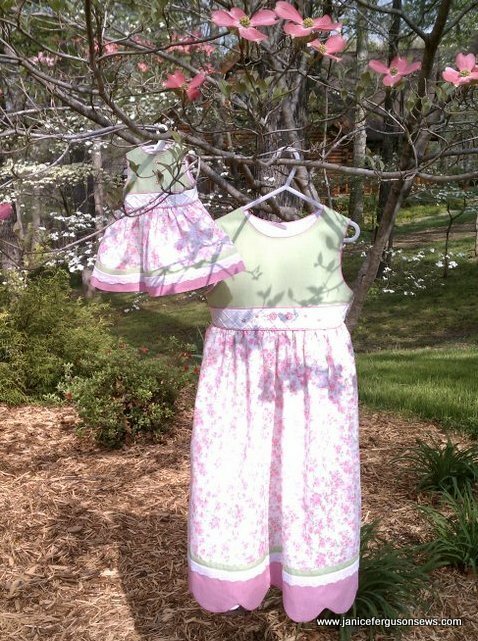 This christening gown was the main project for the Babylock school I taught at Martha Pullen’s school in Huntsville, AL, a few years ago. 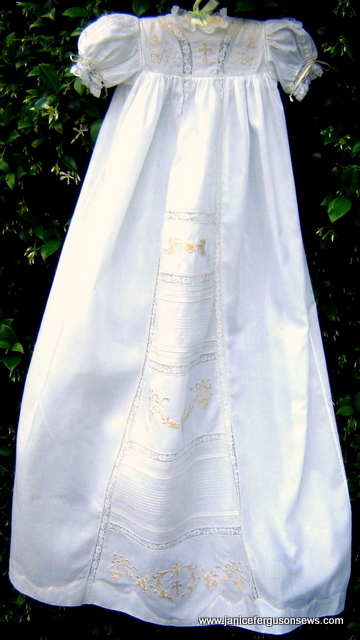 The ecru and white combination has always seemed the height of elegance to me. Also, since photos had to be posted on the school web site, the ecru embroidery showed up much better than if the embroidery had been white on white. 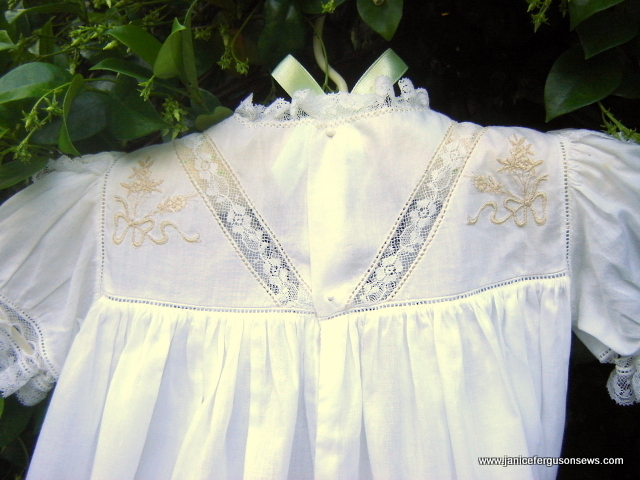 It seems to me that anytime Swiss batiste, imported trims and heirloom sewing techniques are combined, the result is likely to be something beautiful. 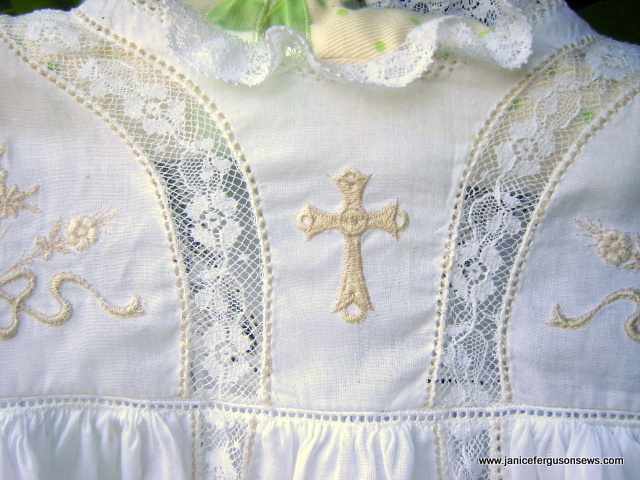 In this case, the classic christening gown is a melange of Swiss batiste, French lace and entredeux. 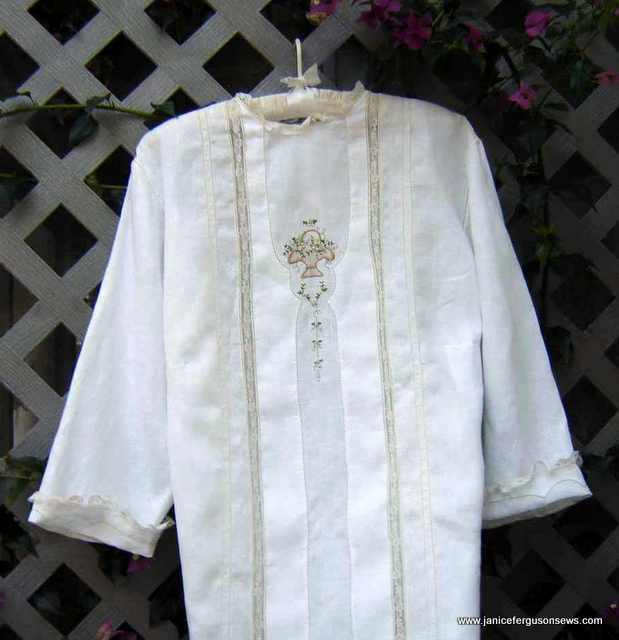 Elaborately embellished, it includes classic details such as point de Paris, Madeira appliqué, shaped French Val lace, feather stitching, pin tucks, twin needle shadow work, and delicate embroidery. 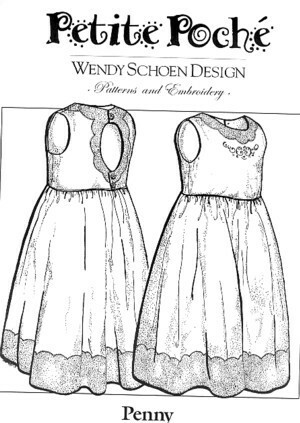 Also incorporated into the gown’s design is Lace Tape, a recently rediscovered heirloom trim, applied as a shadow appliqué on the wrong side of the batiste.